Yesterday, I went in search of this meme that I remembered seeing on Facebook some months ago. John’s account of Jesus “cleansing” the Temple” is the Gospel reading for this coming Sunday. 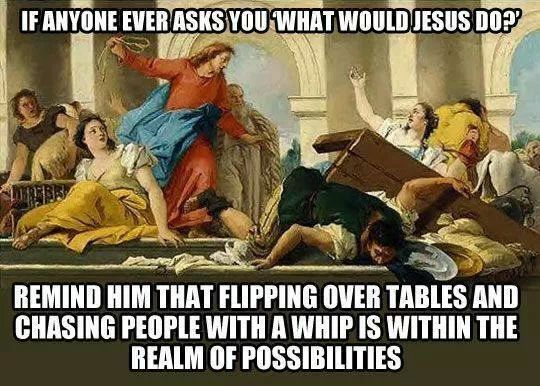 Not only is this spin on WWJD? hilarious, it prompts us to reconsider the tame, saccharine image of Jesus so often portrayed in popular culture. This Jesus challenges systems in direct, uncomfortable ways. Funny captions that spark serious questions are how social media memes function at their best. My Google image search also revealed this meme, which I had never seen before. I clicked on it to make sure I was reading the thumbnail correctly. Sadly, I was. 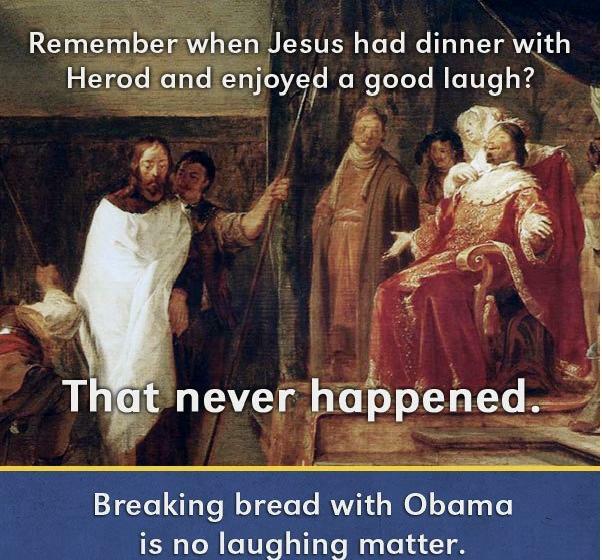 This meme appears to have circulated on social media in 2012 in an attempt to persuade Cardinal Timothy Nolan to uninvite President Obama from the annual Alfred E. Smith Dinner, where the President and Mitt Romney were scheduled to speak. Presumably, the meme’s creators disagree with various aspects of the President’s politics and felt the Cardinal’s invitation amounted to a blessing of his policies (never mind the dinner’s long-standing tradition as a forum for both Presidential candidates in election years). Whatever the partisan politics of the moment might have been, this meme is as abhorrent as the WWJD meme is provocative. The idea that faithful Christians don’t eat or otherwise associate with those who aren’t also faithful Christians is about as Christian as Obama is Muslim. (Jesus had a slightly different take on the subject). It flows from a mindset that says: if you believe differently from us (or we think you believe differently from us), then you are the enemy. You must be isolated and ultimately defeated. Such rationale is nothing new. It is the basic syllogism of fundamentalists in every religious, ideological, and political camp. Southern Baptists succumbed to it in the 1980s and -90s. The poles of both the Republican and Democratic Parties are rife with it today. Theofascist groups such as ISIS and the Taliban embody its most extreme forms. “Blacks were 68 percent less likely to have cases dismissed by Ferguson municipal judges and disproportionately likely to be subject to arrest warrants. From October 2012 to October 2014, 96 percent of people arrested in traffic stops solely for an outstanding warrant were black. The Justice Department also uncovered damning emails from within the Ferguson police department. Again, the mindset is the same as the Alfred Smith Dinner protest meme, but the content too extreme to be circulated in the media. These are the patterns and communications of a system that believes African-Americans are the enemy, and they must be isolated and defeated. Reading the Ferguson report is nauseating, but we need to recognize the infection for what it is and take this twisted system on – head on. Awareness of such a fundamentalist mindset is the first step in treating the parasite and reversing its effects. Healing will take time, and require a medicinal cocktail of procedural overhauls, training improvements, and changes of heart. This last piece of the prescription will be the most difficult. Ironically, the Alfred E. Smith protest meme provides a path for affecting such changes of heart – not unlike a spiritual form of penicillin. We need to break bread with those who are different from us. To break bread with someone is to invite them into relationship with you. When we eat together, we talk. When we talk, we get to know one another. The space around a table is intimate space, and sharing food is an essential component of hospitality. Jesus understood that, which is why it’s really not the least bit surprising to find a Table at the center of the Christian faith narrative. He may have overturned some tables in the Temple, but Jesus gathered His disciples around a Table on the night He was betrayed. He offered them bread and wine. In so doing, He offered His very Self. That simple meal constituted a new covenant with each of them – different though they were. Even His betrayer was included. Re-enacting this meal, sharing in the bread and the cup together, is still how Christians of different races, ages, sexes, economic backgrounds, education levels, and theological persuasions find (and demonstrate) unity with each other in Christ. In Bishopville, SC, another kind of meal is specifically bringing black and white football players together across a deep gulf of historic racial division. Click here to read the article from the Washington Post. Bishopville is no racial utopia; many of its problems and issues are identical with those in Ferguson and elsewhere. But Bishopville’s mindset is the antithesis of Ferguson. This small southern town is making strides through consistent effort and intentional practice that is as simple as having boys from different backgrounds who share a common interest in football sit down and share a common table as well. As we continue to digest the Ferguson report and grapple with its findings and implications, may Bishopville serve as an example – not only that things can be different, but how.